Twitter banned Loomer a week ago after she tweeted that Congresswoman-elect Ilhan Omar was anti-Jewish and pro-Sharia law. Far-right activist Laura Loomer handcuffed herself to Twitter's New York City headquarters for about two hours on Thursday afternoon to protest the company's banning her from the social media platform, then asked police to remove her. Loomer attached herself to the building's front door, blocking the entrance to the building in Manhattan's Chelsea neighborhood in a protest that was livestreamed on Periscope, which began at about 3:45 p.m. ET. The video stream showed Loomer wearing on her chest a yellow Star of David such as many European Jews were forced to wear during the Holocaust, and a sweatshirt that read on the back, "#STOPTHEBIAS." Twitter closed the conservative firebrand's account a week ago after she posted a tweet criticizing Minnesota Rep.-elect Ilhan Omar, a Democrat, and her Muslim faith, calling Omar "anti Jewish" and pro-Sharia law. At one point Thursday, Loomer yelled through the doors of Twitter's building, telling its employees that they worked for an "evil" company. She also yelled to a group of people who stood across the street, "They don't want you guys to know the truth." "I am not going to stand by as people like Jack Dorsey and Mark Zuckerberg [try to] silence the voices of millions of conservatives," Loomer said. She asserted that Twitter CEO Jack Dorsey banned her as a "Jewish conservative journalist," a phrase she yelled repeatedly while chained to the building. Twitter released a statement during her protest, saying, "We have notified the relevant authorities who are responding. The account holder was suspended for violating our policies. We apply the Twitter Rules impartially and not based on ideology." New York police officers at first asked Loomer to uncuff herself from the building's door citing a fire hazard, but she refused. When asked what the police were going to do, one officer told NBC News, "It's not my call... It's up to my supervisor." Another officer told NBC News he had "no idea" who Loomer was. Police at the scene prevented journalists from approaching Loomer, but did allow people who appeared to be working with her to help her post on social media. Officers also turned away a pizza delivery, which someone had apparently ordered for Loomer. At about 6 p.m. ET, police, at Loomer's request, used a bolt cutter to cut through her handcuffs. She was not arrested. Twitter in recent months has banned from its platform some other far-right figures, such as conspiracy theorist Alex Jones for violating its terms of service. 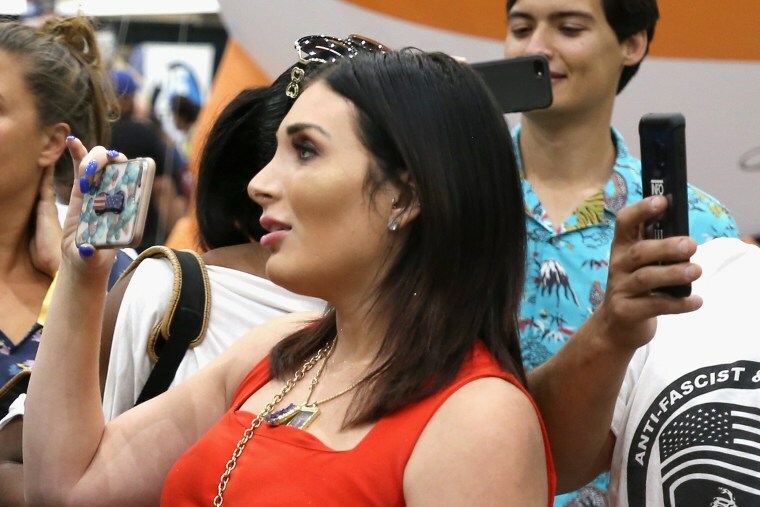 Loomer's protest came as Twitter has faced growing conservative backlash for what some far-right activists have claimed is the platform's liberal bias. Shoshana Wodinsky writes for NBC News.